The rubell Family Collection and Contemporary Arts Foundation is pleased to announce its upcoming exhibition, No Man’s land: Women Artists from the rubell Family Collection. The exhibition will focus on and celebrate works made by over seventy contemporary female artists of diffe The Rubell Family Collection and Contemporary Arts Foundation is pleased to announce its upcoming exhibition, NO MAN’S LAND: Women Artists from the Rubell Family Collection. The exhibition will focus on and celebrate works made by over one hundred contemporary female artists of different generations, cultures and disciplines. AboUT The exhibiTioN The rubell Family Collection and Contemporary Arts Foundation is pleased to announce its upcoming exhibition, No Man’s land: Women Artists from the rubell Family Collection. The exhibition will focus on and celebrate works made by over seventy contemporary female artists of diffecontemporary female artists of different generations, cultures and disciplines. The rude interjection is a staple of New York life. Now, the landscape of the city will itself heckle residents and tourists, with a brash new sculpture in Brooklyn Bridge Park that yells “YO” if you are looking at it from Manhattan or “OY” if you are gazing out from Brooklyn. The sculpture, “OY/YO,” is the first of this size from the artist Deborah Kass, who describes herself as a “total, absolute, 100 percent provincial New Yorker.” It was commissioned by a Brooklyn developer, Two Trees Management Company, and was placed in the park on Monday. Paul Kasmin Gallery is pleased to announce DEBORAH KASS: No Kidding, an exhibition of new mixed media paintings on view at 515 West 27th Street from December 9, 2015 – January 23, 2016. Mounted on fields of primarily black and blue, Kass incorporates neon lights in her paintings for the first time, limiting her signature palette, to spell out puns and phrases bearing pop cultural references that provide a somber meditation on the troubling present, and uncertain future. Brooklyn-based artist Deborah Kass is bringing a bit of artistic word play to her native borough with OY/YO, her first monumental sculpture, on view at the foot of the Manhattan Bridge. "YO" refers both to the Spanish for "I am" and to urban and Brooklyn slang, while "OY" is a common Yiddish word expressing woe, dismay, or annoyance. The "oy" came first for artist Deborah Kass. "It came from a painting I did a few years ago that said 'oy.'" she said. Kass only discovered the "yo" when she transformed her 2D painting into a 3D sculpture, now installed beneath the Manhattan Bridge in Brooklyn Bridge Park. "It was simply a matter of how can you not say, 'Yo, Brooklyn'?" Kass said. "Which left 'Oy, Manhattan.'" Brooklyn Bridge Park's latest art installment is a large, yellow, two-letter word, sitting atop a waterfront berm, visible from both Manhattan and Brooklyn. When facing Brooklyn, the letters read "yo." When facing Manhattan, they spell "oy." Two letters of the alphabet are bringing two distinctly New York expressions to life in Brooklyn Bridge Park. A new sculpture near the East River is spelling out different greetings to visitors. But it's all a matter of perspective. The bright yellow aluminum sculpture says "Yo" when seen from Manhattan. But it says "Oy" when seen from Brooklyn. The piece was created by artist Deborah Kass. It went up this week in Brooklyn Bridge Park's Main Street Lawn, and will remain there through next August. A piece of art on display at Brooklyn Bridge Park is sending different messages to different people. Artist Deborah Kass created the bright yellow sculpture, called "Oy-Yo." It either looks like the word "Oy" or the word "Yo" depending on whether one is viewing the sculpture from Brooklyn or Manhattan. Installation of OY/YO sculpture by Deborah Kass in Brooklyn Bridge Park. November 9 2015. Produced by Lovett Productions. Those heading to Dumbo or Manhattan will get a bold shout out come Nov. 9, when Deborah Kass’s first public sculpture is installed in Brooklyn Bridge Park. Huge yellow aluminum letters, visible from the F.D.R. Drive, will spell “YO” against the backdrop of Brooklyn. The flip side, for those gazing at Manhattan, will read “OY.” The Two Trees Management Company, a Dumbo-based real estate developer, commissioned the artwork, on view through next summer. Join us November 17, 2015 for the 21st annual ARTWALK NY. We are thrilled to honor Artist Honorees Deborah Kass and Patricia Cronin and Philanthropic Honorees Alec Baldwin and Richard Gere. Sargent’s Daughters is pleased to present America’s Most Wanted, 1998-1999, a historical series of silkscreen on canvas works by Deborah Kass. This will be the first time the work will be exhibited in its entirety and in New York. In 1998 Deborah Kass asked young and promising museum curators to take part in her current project: America’s Most Wanted. Based on Andy Warhol’s 1964 World’s Fair public commission for the New York State Pavilion: The 13 Most Wanted Men, Kass’ series substitutes curators for criminals. Warhol’s original mural was deemed inappropriate by then-Governor Nelson Rockefeller and painted over with silver paint. In 1967 Warhol used some of the same screens to make his series Most Wanted Men, which was then shown at Galerie Sonnabend in Paris 1967. The Queens Museum then showed the work in April 2014, only 200 yards from the original site of the mural. Artist Irena Jurek visits artist Deborah Kass to discuss the artist's work. Deborah Kass is represented by Paul Kasmin Gallery, NY. The Andy Warhol Foundation today announced the election of board chair, Lawrence Rinder, and three new board members, Shana Berger, Deborah Kass and John Taft. Deborah Kass is an artist whose work examines the intersection of art history, popular culture and the self. Her paintings are in the collections of The Museum of Modern Art, The Whitney Museum of Art, The Solomon Guggenheim Museum, The Jewish Museum, The National Portrait Gallery, as well as numerous other public and private collections. Her work has been shown nationally and internationally at the Venice Biennale, the Istanbul Biennale, the Museum Ludwig, Cologne, the Metropolitan Museum of Art, and a mid-career retrospective at The Andy Warhol Museum. She is a Senior Critic in the Yale University M.F.A. Painting Program. In each chapter of Art Calls with Tracey Moffatt the well known visual artist takes us into the homes and studios of some of the world’s most interesting and edgy contemporary art world personalities via Skype and by telephone. On the end of the line is mostly visual artists, but an architect, a fashion designer, a writer and even a comedian also feature. All respond in delightful ways to Tracey’s good–humoured banter. Art Calls with Tracey Moffatt was originally made in 2014 as an idea for two half hour television pilots. Heavily influenced by European 1920’s surrealist films, the show was made on a shoestring budget and produced in a suburban backyard studio in Ipswich Queensland. Art Calls with Tracey Moffatt is currently showing as part of Tracey’s major art exhibition Spirited at QAG|GOMA in Brisbane Australia from October 25 2014 to February 8 2015. Art Calls with Tracey Moffatt is available to view on abc.net.au/arts until January 31, 2015. Paul Kasmin Gallery is pleased to share that selected works from Deborah Kass' feel good paintings for feel bad times series will be on view at Arthur Roger Gallery in New Orleans, Louisiana from October 4 - 25, 2014. This exhibition of neon works and large-scale paintings on canvas is Deborah Kass’ second with the gallery. Drawing from contemporary society, Broadway musicals, Yiddish and prominent art figures, she continues to incorporate lyrics and vernacular, melding art history and pop culture in vibrant, resonating compositions reminiscent of Frank Stella and Ellsworth Kelly. The work is depictive of the current posture of popular and political culture and the ensuing dysphoria, especially in contrast to the optimism of the postwar era. Deborah Kass received her B.F.A. in Painting from Carnegie Mellon University in Pittsburgh, PA in 1974. Prior to that she attended the Whitney Museum Independent Studies Program in New York. She has been the subject of numerous one-person exhibitions, including an exhibition originating at Tulane University Art Gallery that traveled the U.S. in 1999-2001. In the fall of 2012, The Andy Warhol Foundation presented her mid-career retrospective, accompanied by the publication of her monograph, “Deborah Kass: Before and Happily Ever After.” She is the recipient of several awards, including an NEA fellowship in painting in 1987. Her work is in the collections of the Museum of Modern Art, the Solomon R. Guggenheim Museum, The Whitney Museum of American Art, The Jewish Museum, The Museum of Fine Arts, Boston and the Harvard Art Museums/ Fogg Museum. She is a Senior Critic in the Yale University Painting M.F.A. Program, and in 2014 she was inducted into the New York Foundation for the Arts' Hall of Fame. She lives and works in Brooklyn, New York. The Street in Chestnut Hill is getting into the public art game—a game in which everyone wins, of course. On Thursday, the shopping center debuts a brand-new public art installation by noted artist Deborah Kass. The collection comprises 39 banners and one billboard including Kass’s iconic works C’mon Get Happy, Forget Your Troubles, Sweet Thing, Let the Sunshine In, and OY YO. Visitors can access a free cell phone tour of each work given by Kass herself, and the installation will be on view at The Street until 2015. Visual AIDS 2014 Benefit Print Artist, Deborah Kass, is interviewed in her studio by Board Member Steed Taylor about the influence of AIDS and AIDS activism on her art, her decision to support Visual AIDS and why you should too, details about her benefit print and advice for the HIV+ artists in our Visual AIDS Artist Registry. Visual AIDS utilizes art to fight AIDS by provoking dialogue, supporting HIV+ artists, and preserving a legacy, because AIDS is not over. In conversation with Gracie Mansion, senior specialist in Modern and Contemporary Art for artnet Auctions, artist Deborah Kass (American, b.1952) sheds light on the driving forces behind her distinguished career. Perhaps best known for her series The Warhol Project, Kass talks about her recent departure from the figurative to vibrant, content-based, language works, which comprise her feel good paintings for feel bad times series. Filmed at the Paul Kasmin Gallery in New York City, Kass discusses the importance of the politics of power and appropriation, and the effects of feminism and ethnicity that have come to define her oeuvre. She explains the importance of giving voice to those outside of the ‘Great, White Male’ history of art. I, YOU, WE is organized by David Kiehl, Curator, Prints. It’s been a banner year for painter Ms. Kass. She published her first monograph, was honored with a mid-career retrospective at the Andy Warhol Museum in Pittsburgh, and is currently the subject of a solo show at Paul Kasmin Gallery (on view through February 23). Perhaps the most accomplished female painter to emerge since the 1970s, Ms. Kass is a pioneer who consistently pushes the pop art envelope. Paul Kasmin Gallery is pleased to present My Elvis +, an exhibition of paintings by Deborah Kass from her historic series, “My Elvis” created in the early 1990’s. Gathered for the first time in the artist’s career and presented to a new generation of viewers. Also on view “+” her first and last self-portraits from her historic “Warhol Project”: “Portrait of the Artist As a Young Man” 1994, “Altered Image #2” and “Red Deb” 2000. My Elvis + will be exhibited at the Gallery’s 515 West 27th Street location January 24 – February 23rd, 2013. Paul Kasmin Gallery is pleased to announce that Deborah Kass will have a mid-career retrospective at The Andy Warhol Museum in Pittsburgh, Pennsylvania. Opening in February of 2012, the exhibition will be curated by Eric Shiner and will include about 75 works ranging from her drawings, paintings and sculpture. On Sunday I flew to New York to meet with artist Deborah Kass, so that we could make the final selection of works to be included in her mid-career retrospective that will launch at the Warhol next spring. The show will include a full range of Kass's paintings, including works from the series "Art History," in which she combines art historical imagery with stills from Disney cartoons, and "The Warhol Project," in which she extended the earlier artist's formal vocabulary to icons who didn't get the Warhol treatment. It will also present drawings, source materials and ephemera. While digging through a box of Polaroids used for "The Warhol Project," we found some incredible images of Cindy Sherman vamping as Liza Minnelli. Leading curator and critic Robert Storr joins influential artist Deborah Kass for a wide ranging informal conversation on the occasion of the publication of her first monograph Deborah Kass: Before and Happily Ever After (Skira Rizzoli 2012) in conjunction with her mid-career retrospective exhibition at the Andy Warhol Museum in Pittsburgh, Pennsylvania. Two art world veterans get together to discuss art, life, politics and music. Expect the unexpected. In the late 1980s and early 90s Deborah Kass startled the art world with paintings that began to alter the narrative of contemporary art history. Using the work of painters that came before her—Johns, Pollock, Stella, Warhol—art history became the medium with which Kass questioned and ultimately rewrote the story of postwar art that was considered, more or less, written. Her infamous Art History Paintings, instantly controversial, came after a successful decade of showing landscapes and abstract paintings in New York, and were followed by the groundbreaking Warhol Project works that looked a lot like Warhol’s but with a difference. In place of Liz, Marilyn, or Jackie there was Barbra Streisand instead. The Warhol Project problematized our then codified ideas related to gender and ethnicity, helping stoke the still nascent discussions around identity. Simultaneously marginalized by the art world and embraced by collectors, critics, and art historians, Kass has fearlessly staked out a singular place in contemporary art history. The first comprehensive book accompanying a major touring exhibition by the painter Deborah Kass. More than any artist of the last thirty years, New York City–based painter Deborah Kass has made it her life’s work to position women artists on the great paternal playing field of art history. From her early paintings of the sea pounding rocky shores to her eponymous Warhol Project series and her recent text-based works, Kass has quite literally fired the canon, challenged the status quo, and refigured art history. The book features in-depth essays by a panoply of important figures, including Robert Storr, renowned curator, professor, and onetime subject of a Kass painting, and Griselda Pollock, one of the most important feminist art historians in the field. The volume can be seen as both a primer on feminist movements of the past thirty years and as a potent wake-up call to the establishment that artists of Kass’s caliber must be at the forefront of today’s art world. New York “IT’S ALWAYS BEEN my impulse to use art history as almost a ready-made,” Deborah Kass told the filmmaker John Waters in 2007.1 In her big, pop-infused paintings, however, Kass is no cool-headed Duchampian, and her borrowings are anything but polite. Coming of age in the era of the Pictures Generation, and pursuing its lessons throughout her three-decade career, Kass has pilfered details of well-known 20th-century paintings and snatched the glamour of Warhol’s stars for her own Jewish, lesbian and feminist idols (and herself ). In colorful found-text paintings, she broadcasts uncool Broadway musical lyrics as well as quotations critical of male dominance in the art world. Yet at the same time, Kass pays affectionate homage to all her sources, whether art historical or musical, and to an art-world society with which she maintains a close bond, even as she castigates it for sins and omissions. Artists, collectors and historians appear often in “The Warhol Project” (1992-2000), which includes her best-known works. Within that series, her 1998 screenprint paintings “America’s Most Wanted” present eminent (and sometimes ominous-looking) curators and critics in faux mug shots, as if they were criminals of vast notoriety rather than members of a rarefied elite. “COMING out as a Barbra Streisand fan was way more embarrassing than coming out as a lesbian,” the painter Deborah Kass said on a recent morning in her Brooklyn studio. “To be an artist of my generation willing to be unhip — artists were supposed to be like cowboys.” But in 1992 Ms. Kass, then 40, had the idea to borrow the format of Andy Warhol’s Marilyn Monroe and Jacqueline Kennedy silk-screens and swap in an image of Streisand that prominently displays her distinctive profile. 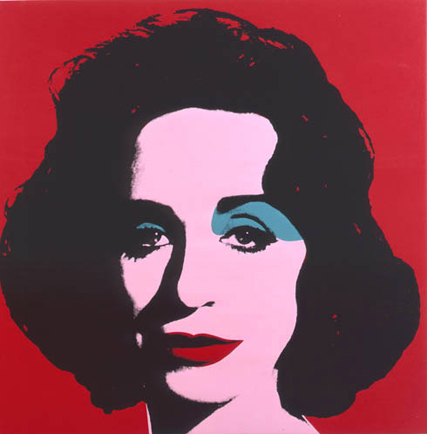 Titled “Jewish Jackie,” the series is a loving and poignant homage to both Warhol — a sickly child from an immigrant family and a gay man who became one of the most famous artists of the 20th century — and Ms. Streisand, the multitalented performer and director who never changed her nose or name. It has been my good fortune to experience the Deborah Kass Effect. I mean that at Kass's present retrospective, Before and Happily Ever After, at the Andy Warhol Museum in Pittsburgh, I felt myself liberated from the constraints of time, space and identity. For those who haven't experienced the Deborah Kass effect, suffice that I compare it to the Virginia Woolf Effect--the phasing in and out of time streams and locales, masculine and feminine identities. The difference is that, the Kass Effect isn't achieved in reading a story, but in viewing a painting. If the comparison seems eccentric, consider that Kass is invested in making visual art a process akin to the literary and theatrical experience of entering into the minds and bodies of her subjects with the same disregard for physical boundaries that is the facility afforded writers of fictions and histories. Except, of course, that her language is as much the iconography and signage of pictures and paint as it is the written word. Or really, and quite literally, the painted word. For decades, commentators have observed that Andy Warhol's influence is dominant in contemporary art. This exhibition will be an in-depth examination of the nature and extent of the Warhol sensibility organized around themes, each of which will be delineated by several of Warhol's works, along with objects by other artists who have worked in his wake. The aim is not only to show direct influence, but also to indicate how an artist may have developed Warhol's example into new areas and accomplishments. Accompanied by a catalogue. The Contemporary Arts Museum Houston is pleased to present The Deconstructive Impulse: Women Artists Reconfigure the Signs of Power, 1973-1991, a survey of leading women artists that examines the crucial feminist contribution to the development of deconstructivism in the 1970s and '80s. As the term suggests, deconstructivism involved taking apart and examining source material, generally borrowed from the mass media, to expose the ways commercial images reveal the mechanisms of power. Women had a particularly high stake in this kind of examination and were disproportionately represented among artists who practiced it. Seeing Gertrude Stein: Five Stories features more than 50 artifacts and 100 works by artists from across Europe and the U.S., detailing Stein’s life and work as an artist, collector and distinctive style-maker. Reprising the moods and painterly modus operandi she established for her 2007 Feel Good exhibition, Deborah Kass again banners lyrics across abstract iconography recalling the art of Andy Warhol, Ellsworth Kelly, Frank Stella, and Bruce Nauman. But what on the surface impresses the viewer as regurgitations of Pop Art, on closer inspection reveals itself to be a self-portait of a woman artist courageously confessing her life-long envy of, and ambition to become as talented and great as the men of modern art history. Yet, whereas Kass's first show was marked by a vulnerability and self-deprecation resoundly out of sync with an artworld preferring strident dissidence and critique, this time the lyrics of Stephen Sondheim ("Being Alive") and Laura Nyro ("Save the Country") sound a triumphal and clarion fanfare not unlike the finale of a Broadway musical in which the long-struggling heroine at last sublimates all her pain and anguish by making her mark on the world.